Sparkpost extension released: send 100,000 email/month free of charge! The Mandrill email sending service, which a lot of CiviCRM sites were using as a cheap and reliable way to send emails, recently announced major changes in their operations and pricing structure that will certainly make it a lot less attractive to CiviCRM site owners. The latest releases of CiviCRM 4.6 and 4.4 LTS include 2 moderately critical security fixes. It is recommended to upgrade to the latest version to keep your site as secure as possible. The latest versions are now available for downloading AND you can try them out on the demo site. 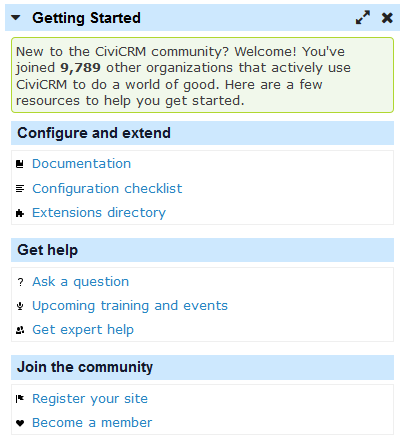 For a lot of new users, CiviCRM can be confusing and intimidating: there are many menu options, the software can do so much, they simply don't know where to start, where to get help, how to ... Get Started with CiviCRM! The latest releases of CiviCRM 4.6 and 4.4 LTS include 2 moderately critical security fixes. While these issues are unlikely to affect the average CiviCRM site, it is recommended to upgrade to the latest version to keep your site as secure as possible. 4.4.13 introduced a regression which could adversely affect some sites so we are putting out 4.4.14. The issue is here and affects 'some IPNs'. We recommend that you upgrade to this version of 4.4 if you are on the LTS. There is very little change in this from 4.4.13 and, as with other LTS releases, no database change. For most users this is a precautionary upgrade. At this stage the only known processor affected is https://civicrm.org/extensions/eway-recurring-payment-processor-agileware. Processors not affected include the other eWay recurring extension, inbuilt ones like Paypal, Authorize.net, DPS, and extensions Omnipay, Cybermut and Paystation. Announcing CiviCRM 4.4.12 and 4.5.6!!! The team is pleased to announce the sixth stable release of the incredible CiviCRM 4.5 series. The LTS team is concurrently releasing 4.4.12 with several bug fixes.